The landscape of Japanese farm villages changes dramatically from season to season. Winter in Japan is generally very cold, but even the cold weather brings with it some amazing sceneries. Please enjoy some of them that are brought to us by the harmonious life of men and nature in Japan. Ainokura is a remote village in the Gokayama region, Nanto, Toyama Prefecture. In winter when heavy snow covers its traditional thatched- and steep-roofed gassho-zukuri houses, the village turns monochrome as if it’s a Chinese ink-wash painting. 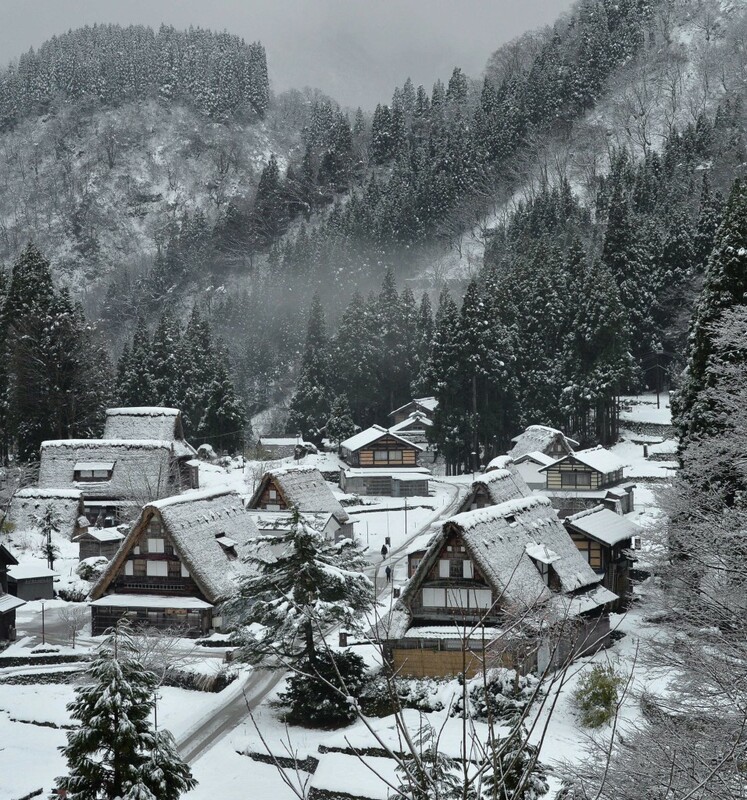 There are two gassho-zukuri villages in Gokayama: Ainokura and Suganuma. In 1995, these villages were designated as World Heritage sites by the United Nations Educational, Scientific and Cultural Organization (UNESCO), along with the Shirakawa-go village in Shirakawa, Gifu Prefecture. The roofs here in Ainokura are made of very thin straws and the oldest house in the village is said to have been built almost 400 years ago. Lake Izunuma is a freshwater lake located in between Kurihara-shi and Tome-shi in Miyagi Prefecture. When the morning sun broke through the cloud over the lake, a flock of white-fronted geese flew into the air at once. This winter, the 369-hectare lake has become winter home to approximately 130,000 white-fronted geese which started to migrate from Siberia in September. They’ll stay until February, sleeping on the water at night and feeding on grains left in the surrounding paddies during the day. The surrounding rice paddies were built from the Meiji era to the first half of 1960s, and today, local farmers and their study group named Namazu-no-Gakko (Catfish School) are making steady efforts to live in harmony with nature. 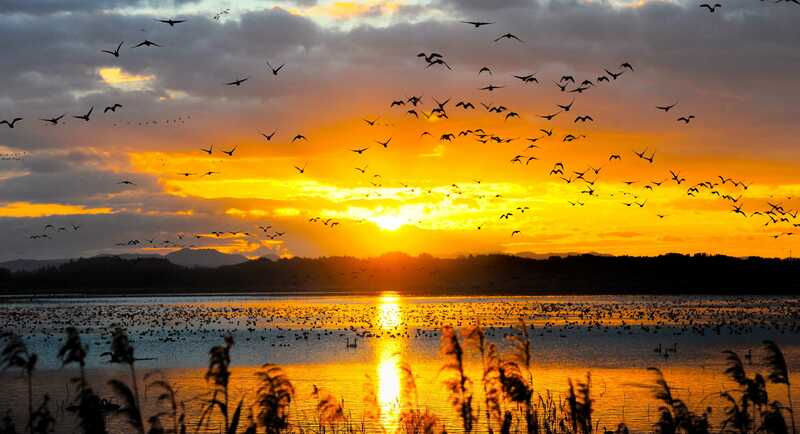 One of their core activities “fuyu-mizu-tambo (flooding rice paddies in winter)” was introduced to this area 13 years ago to make the life of aquatic birds easier. “For farmers here, Izunuma is an important source of water, but it also is a source of comfort,” said Makio Mitsuzuka, a 64-year-old leader of the study group. Every winter, beautiful stripes of red and green appears on the Matsubara Swimming Beach of Lake Biwa in Hikone-shi, Shiga Prefecture. They are red radishes hung out to dry. The reddish violet radishes with very white flesh are called yurugi-kabu and are used to make Japanese pickles. Colorful bunch of the radishes tied together are hung out on “hasa (bamboo and wooden racks)” for approximately ten days. Then, cold winter air coming from the lake takes extra water from the vegetable and gives extra sweetness. 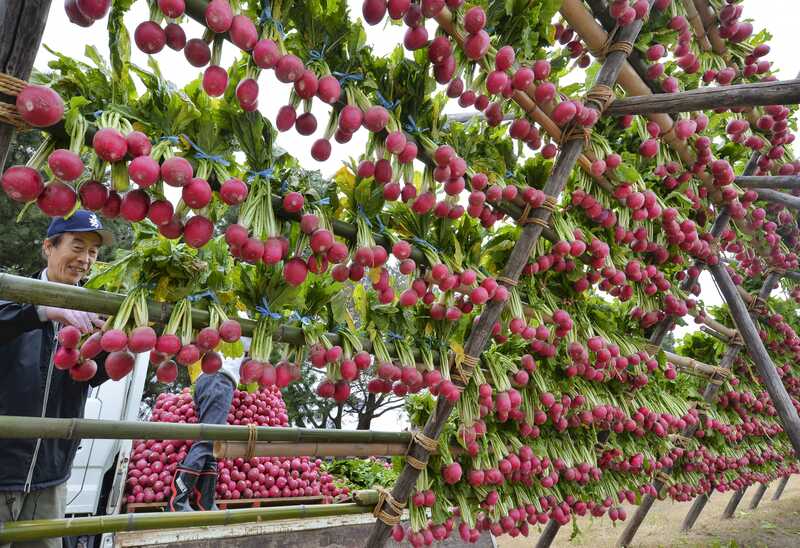 Then the radishes are pickled in “nuka (salted rice-bran paste)” for one or two months and sold as pickles in February. In a park called Kodai Hasu-no-Sato in Gyoda-shi, Saitama Prefecture, there is a giant straw sculpture replicating a steam train of 19 meters long. It’s made of the straw left behind after harvesting the rice paddies that became the recipient of the Guinness Book’s “World’s Largest Rice Field Art Award” in September 2015. 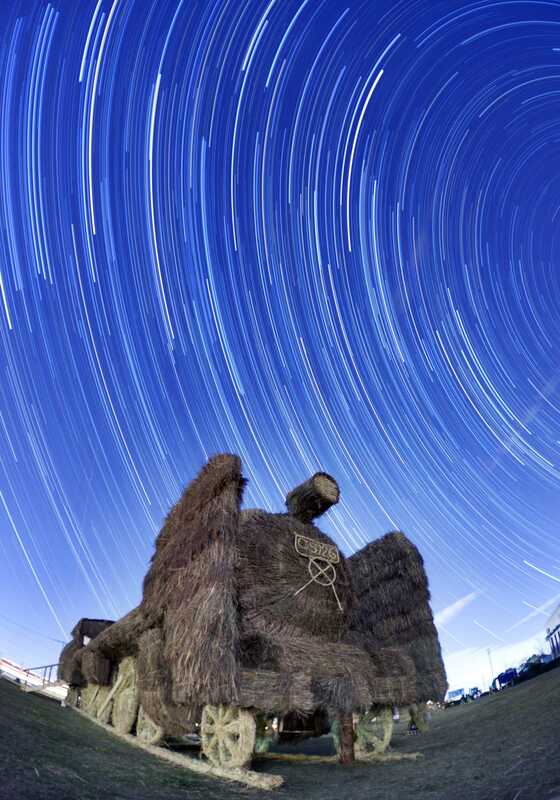 One day, I took 331 serial photographs of the straw train and the starry sky. When all these photos were stacked into one image, the star trails appeared and it was like a steam train hurtling in the dazzling night sky. These unique sculptures will remain until the March 27, 2016. This entry was posted in Cooperatives, Food & Agriculture, Others, Photos and tagged Feature. Bookmark the permalink.